...this book when the revised edition comes out. There are a few books on the topic, but this would be the most recent revised edition that one could find. Its a subject that fascinates me, especially after two children and my own negative experiences with the staff in the hospital and clinics we've been to. Every day more than 3,000 babies die from infections due to a lack of breastfeeding and the use of bottles, artificial milks and other risky products. 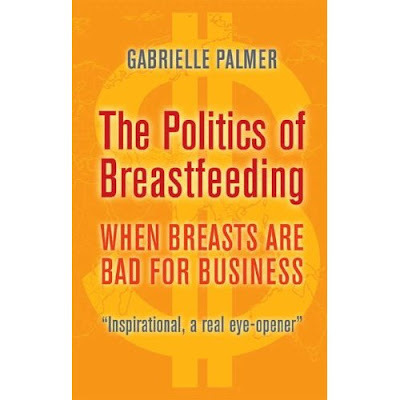 In her powerful and provocative book Gabrielle Palmer describes the pressures on women, health workers and governments who are enmeshed in collusion with the sellers of infant feeding products. These companies invest in marketing strategies and clever promotion which help maintain practices that contribute to the suffering, illness and death of children in both poor and rich nations. Gabrielle Palmer vividly describes the far-reaching consequences for health and well-being that the actions of large corporations have on global politics and the environment. With an engaging blend of facts, insight and anecdotes, she puts infant feeding fashions into their historic and economic contexts. An essential and inspirational eye-opener, "The Politics of Breastfeeding" challenges our complacency about how we feed our children and radically reappraises a subject which concerns not only mothers, but everyone: man or woman, parent or childless, old or young. This is the 3rd fully revised and updated edition. What happens when you live near a natural lake area....we sat on the front step last night watching two that were on separate rooftops and were "talking" to each other (translate - total cacophony of honking loud noises, so funny) and now this guy on my back neighbors roof tonight, who's rather quiet. Until another lands on a nearby rooftop I am sure! The annual craze has started, this past week I have cleaned out the flowerbeds, added new soil and manure, raked the grass, and then yesterday planted my lily and glad bulbs, AND finally pulled out that damn tree in the front. Its been half dead (ash mites) for about 2 years now, we tried to save it, but it was so far gone that Mike was able to get it out by just bending it back and forth for a few minutes, everything was so weakened it just came right out. I also pulled out my dogwoods cause I am sick of them and they aren't flourishing either. The rabbit is completely enjoying chewing the twigs, I will have nothing but the root system to throw out in a week or two after she's done having her fun. There's only 2 weeks till May long! I have to get so much done before we go on our trip too, we're going right in the peak gardening time for me.